In the most romantic Iranian city, Shiraz, which went down in the history of the East as the city of poets, orchards and wine, is a fortress built by Mohammad Karim Khan the Great, the founder of the Iranian Zand dynasty. 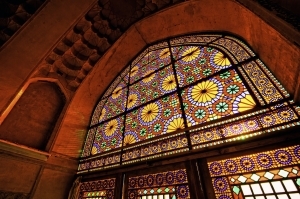 Monumental buildings, now one of the most important historical gems in Shiraz, and the Zand Dynasty Relics Museum are located in the city centre, at Szochad Square. 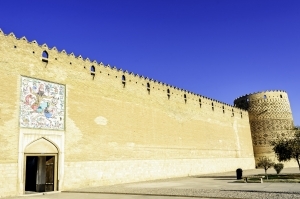 The fortress’s impressive appearance, its huge walls and towers were designed like the ancient citadels of Central Asia, but inside the fortress presents a sophisticated and elegant palace complex which, according to Karim Khan, was to be better than Isfahan's palaces. In 1981 Pars Museum was open in the Karim Khan Fortress, it contains displays dedicated to the Zand dynasty and the history of the city. In the north-west part of the building visitors' attention is attracted by an installation which shows how the reception of envoys from Europe was held in the Karim Khan Palace. Parts of murals and the ceiling remained in some rooms, they once decorated nearly the whole building complex. In the south part of the courtyard is a palace hammam and a tea room which provided some rest for Shiraz’s ruler’s body and spirit. In the north-east part of the pavilion one can learn about how the fortress looked like and what happened there at the end of the 19th century and at the beginning of the 20th century. A great mock-up of Shiraz is displayed there, you can also see a huge display with photographs and documents of that period. 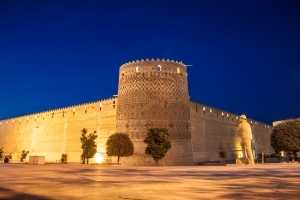 Outside, the Karim Khan Fortress also looks great, the huge and solid walls harmonise perfectly with the beauty of the four round towers built in the four ends of the fortress. Each tower is 14 m high, and fancy geometrical ornaments filled with brick give the towers an original and elegant look. The fortress's south tower, which is slightly tilted and resembles the famous Leaning Tower of Pisa, enjoys great popularity among tourists. The walls of the Karim Khan Fortress are in a typical medieval style: approximately 3 m thick, with openings – loopholes, and crowned with merlons.